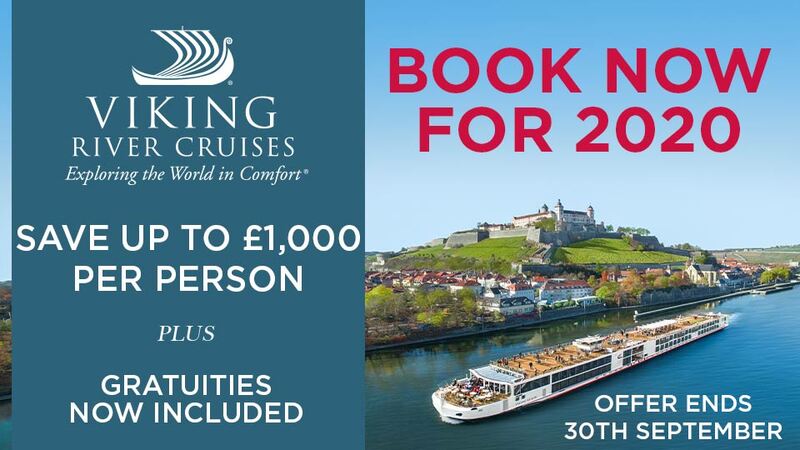 A wonderful cruise visiting some of the most fascinating & beautiful sights straddling the majestic Rhine & Moselle, two of Europe's most picturesque rivers. Take a late morning Eurostar from London St. Pancras International arriving in Brussels, where a coach will take you over the German border to your ship. Moored in Cologne’s picturesque historic centre, the dedicated crew will welcome you aboard your first-class floating hotel, ensuring you settle into your comfortable and extremely well equipped cabin and familiarise yourself with the ship. Alternatively flights from regional airports are available at a supplement. The first morning on board a river cruise is always a thrill, awakening to the peaceful lapping of the water outside as the scenic valley sides slip past your cabin window – there’s no other holiday experience quite like it. Breakfast is a leisurely affair; life on board is unhurried, so you can linger over that extra cup of tea or coffee. You’re cruising some of Europe’s most dramatic and romantic waterways – the mighty River Rhine and its tributary the Moselle. The Sun Deck is perfect for an invigorating mid-morning stroll, watching picture-postcard villages with slanting timber-framed houses pass by. After a delicious lunch, glide into your moorings at Cochem, the traditional centre of the Moselle wine trade. Dominating the scene is a multiturreted castle crowning a vineyard-covered hillside, but Cochem’s real charm is its jumble of narrow streets lined with pastel-coloured buildings and peppered with quirky shops and wine cellars. There’s ample time to explore here, immersing yourself in the relaxed ambience of this quintessential riverside town, before stepping back on board to enjoy the chef’s choices for dinner, served in the splendid environs of the ship’s restaurant. Leaving Cochem, pass through an impressive series of four locks. All around are steep, treecrested slopes covered in a patchwork of vineyards, crisscrossed by narrow tracks and roads giving workers access to the vines – it’s a miracle that anything can be cultivated on such terrain. Before long you will approach the delightful town of Zell. After lunch drive to Trier for an afternoon tour of one of Germany’s most fascinating cities – and its oldest. Founded by the Romans, it was the capital of much of their empire, encompassing present-day Spain, France, Britain and parts of Germany. The city had a population of 80,000 people – an enormous number in ancient times – and the Emperor Constantine lived here. Many of its Roman monuments, including the amphitheatre, baths and bridge, have survived surprisingly intact, but most impressive is the Porta Nigra, a fortified gate made of huge stone blocks that towers above the surrounding medieval buildings. This is the largest and bestpreserved Roman city gate north of the Alps and stands as testimony to their architectural genius. Such is the significance of Trier’s Roman heritage and its other buildings, including its Cathedral, the oldest bishop’s church in Germany, that together they form a UNESCO World Heritage Site. Return to your ship, moored in the charming town of Bernkastel, in time for another exquisite meal. The ship remains moored, so after an unhurried breakfast you’re free to explore Bernkastel, a romantic wonder from another age. Wander its cobbled streets– to the market square, where you’ll be surrounded by some of the finest, most ornate half-timbered houses you’ll ever see, many dating from the 15th century. Most famous is the Pointed House, a jewel of the rustic middle-class building tradition from the Middle Ages and a classic example of a Moselle vintner’s dwelling. 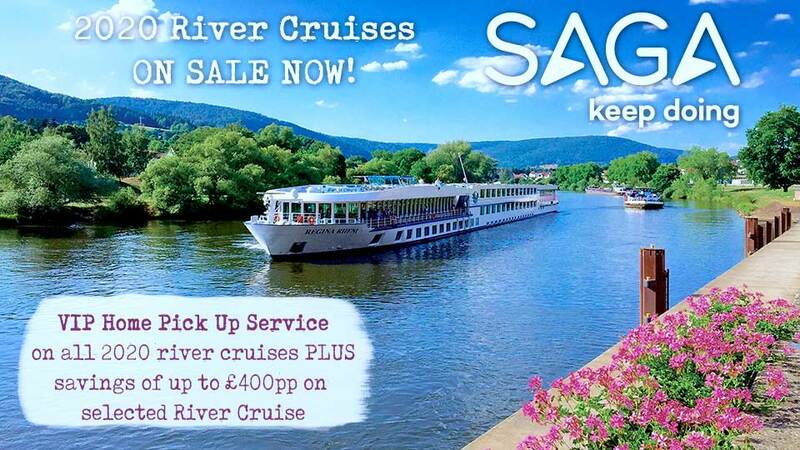 Have lunch on board as the ship slips its moorings as you cruise back downstream commences. This afternoon, just sit back on one of the comfortable deck chairs on the Sun Deck and soak up the atmosphere of this magical river, breathing in the clean air, listening to the rippling water and absorbing the scenery in all its majesty. Another gourmet experience awaits this evening in the ship’s restaurant, possibly followed by a nightcap in the company of newly made friends. Early this morning you will reach Koblenz. Strategically situated at the confluence of these two great rivers, this 2,000-year-old city, with its mighty fortress towering above, is full of appeal. A knowledgeable local guide accompanies us around its principal monuments and intriguing centre, taking in historic squares, highlighting painstakingly restored house frontages and revealing hidden aspects of the city that only locals know. Koblenz is a joy to wander through, pausing to window shop while trying to resist the aromas of fresh coffee and cakes drifting from the numerous traditional cafés. Returning to your ship for lunch, proceed to Boppard, also known as the ‘Pearl of the Rhine’, a famously picturesque town located on a long, looping bend of the river. Captivating cobbled streets, lined by half-timbered houses, tucked-away shops selling traditional goods and characterful restaurants, lead into the town and its main square. Like many riverside settlements in the area, the Romans founded Boppard and their legacy remains in the superbly preserved town walls, the finest in Germany. There’s time to explore or promenade along the river, gazing at views of the vineyard-covered hillsides. Or you can simply pass time on board in anticipation of more fine dining in the ship’s restaurant this evening. 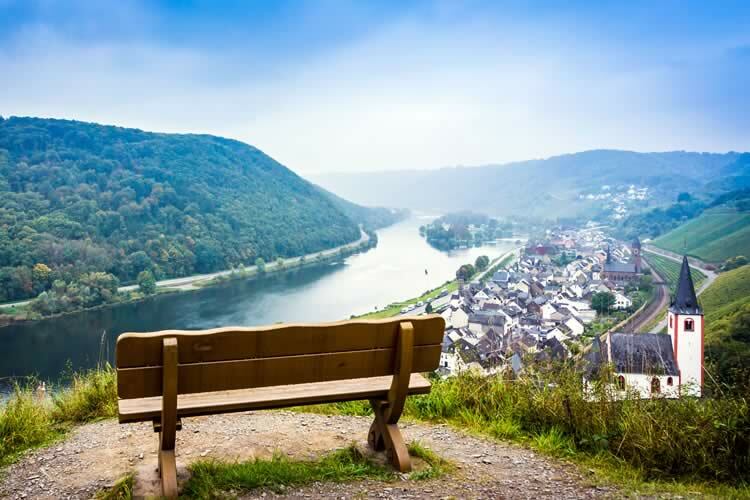 Leaving Boppard, as the sun crests the surrounding hilltops, expectation rises at what lies in store as you journey through the outstanding natural beauty of the Rhine Gorge, a UNESCO World Heritage Site. Here, at every dramatic turn of the river, towering valley slopes are crowned by the precarious ruins of castles built by princes to display their power and extort tolls from passing river traffic. The Gorge is home to medieval legends, tales of mysterious happenings and dark deeds, most famously the Lorelei – or ‘murmuring rock’ – said to have lured passing boats onto the rocks with its irresistible song. The villages drifting by – Saint Goar, Bacharach and Kaub – are synonymous with wine production and one of the many thoughtful details of this cruise is the carefully compiled wine list, from which you can choose fine Rhine and Moselle wines to enjoy with the foods sourced from the region. During lunch, arrive in Rüdesheim, perhaps the best known of all the wine towns, with crooked houses sloping down from wooded hillsides and terraced vineyards. There’s a range of options to experience here, including visiting the Asbach brandy distillery (a tasting of this speciality wine is assured, of course) or you could take the unusual gondola lift for its panoramic river views. Especially worth a visit is the excellent mechanical music museum: a collection of around 350 intricate antique musical instruments and musical boxes from all over the world, many in working order, still playing the delicate sounds of yesteryear. Enjoy another fine breakfast with views of pretty riverside towns, backed by the rolling volcanic hills for which the area is renowned. It’s not long before you reach the railway bridge at Remagen, captured intact towards the end of the Second World War, thereby arguably shortening the war in Germany. Not long after, you draw in to the heart of Cologne, in the shadow of the magnificent dual-spired Gothic cathedral for which the city is so famous. It’s a truly monumental building, taking over 600 years to build and featuring myriad religious and art treasures and perhaps the most intricate stained glass windows in Europe. After lunch, join a local guide for an informative tour of the city, with time to explore its tree-lined squares and perhaps visit one of its traditional bars, many of which still brew their own beer. This evening the Captain’s Dinner takes place on board, during which delicious specialities of the regions you’ve visited will be served, hosted by the Captain himself, of course. After dinner, enjoy a final digestif in the bar while reflecting on the memories made on this wonderful cruise through the romantic heartlands of Germany’s most iconic rivers. For all 2018 departures you can now purchase a drinks package, at a cost of £109 per person.